I’m sort of gazing enraptured into the social network pool, hour after hour. 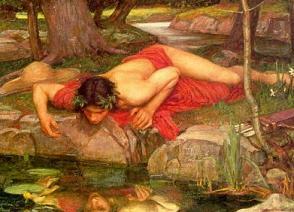 Now I’m curious, when am I going to transform into a Narcissus flower? There’s a fixation over red numbered squares that hover over that tiny virtual world on my screen. And there’s a little quiver you feel for every “like” pressed. That, or you’re kind of a wreck, anxious, because no one seems to like the post. Scary. I might be falling in love with my social network reflection. Scientifically, they state you get a shot of dopamine each time someone likes your post, comments on or shares it. Still, it’s the same dope you get from falling in love. And so, this nonsensical drooling over the numbers I get on my screen, it’s got to be self-love. I read up on it. There’s a correlation between people who score high on the Narcissistic Personality test and those who: have more friends, tag themselves endlessly and update constantly on Facebook. “Facebook serves narcissistic adults as a mirror.” (University of Michigan, Computers in Human Behavior.) It makes sense. Why put a show if you don’t think yourself interesting or the least bit important? Promote the self. Reveal the beloved. Who gets to devour truffles in Turin? Ever sunbathed on miles of white sand with no tourists? Extra-ordinary. Outside the humdrum of everyone’s existence. And you can’t help but share. I trust I haven’t been swept off my feet. That this, is just, healthy self-love. I’m not (yet) staking out friends, jealously keeping tabs on whether they liked or shared someone else’s posts, not mine. I don’t (yet) have the narcissistic tendencies of exhibitionism (i.e. pucker up the lips + bathroom shots) or “superiority” (i.e. Selfie just sitting here, because you really need to see me all the time.) And certainly, I know I am not “The One.” Let’s not go there. Except that you wonder whether you’re in the periphery of almost losing control. Do I post to share a love of life or because I want to show off how much I love mine? Do I measure clicks and likes like I measure myself? Do I lap up the attention, or live off the numbers, starving for validation? Am I eternally grateful or do I feel entitled to the “good one!”, “love it!” and “haha!” all the time? I also just listened to a talk on “Lies.” As he ratted on the kinds of lies, I suddenly realized how much lying we do online. It’s a Photoshopped, spelling and grammar-checked, quotable-quoted reality. And there’s no denying this avatar is quite fetching. How vain, that somehow, the photos I’ve posted have been edited to a very flattering hue. Like wearing heavy make-up and Botox online. Do we ever post a true picture of ourselves? Look at the newsfeed. Isn’t my virtual life just a tad rosier than real life? And so we embellish a bit, overplay, sepia-tone our portraits, and untag ourselves out of unflattering pictures. There’s no space for wrong lighting; wrong angle; wrong smile; and kindly delete that plastic cup on the table. Hacer la vista gorda. Turn a blind eye, pretend you don’t see anything. Because a lie is: (a) a falsehood; (b) made with intent to deceive; and (3) often, brought about by fear. All the elements are there. You blot out things or paint them rosy. Stretch the truth. Without calling it a lie, the underlying intention is to make someone believe in your fib. And somehow, fear is kept out of sight. It’s scary how in the extremes, self-love is self-deception. Yet, everyone knows that this virtual world is almost made-up. A sort of web of white-lies. A taller tale than it should be. Perhaps it’s not a major transgression, like breaking a cardinal rule or committing a mortal sin. And I don’t know where or whether to place it among the Inferno’s circles of hell. All the same, it is a lie, even as you color it white. I am exaggerating. Truthfully. I believe everyone should have a healthy dose of narcissism. An infatuation of the self. Without it, all these thoughts (and creations) stay locked up. And all the true, the beautiful and the good, don’t get posted or shared. Genius needs boldness. And boldness? Well, you get that from being enamored with the self. I also trust my God doesn’t expect me to write dull and drab. I have artistic license to color the world in majestic hues. Even so. It’s good to catch yourself sometimes. Right before you fall into a web of lies, and especially, right before you fall madly, wretchedly and recklessly in love. most people only post about 5-10% of their external lives in facebook. in our case, we have wordpress where we go all out and yet, only a minimum would ever take time to read or learn from our own experiences..